We have a troop train slide show that will enjoy very much. See all about Vietnam troop trains, including the last major troop movement from Junction City, Kansas to Oakland, California. On our site, we cover troop trains on the New Haven Railroad , military movements, hospital trains, camp trains and ammunition trains on the New Haven. We have a section on Freedom Trains. and some great photos at The New Haven Railroad goes to war!!! Although I write many articles on scheduled train travel, I’m really much more interested in special movements (Presidential specials, circus trains and the like). One type of special movement important throughout American rail history has been troop trains. The first war in which trains were used to carry Americans to battle was the Mexican War in 1846. Trains were first used on a large scale to transport armies in the Civil War. Extensive use of trains to carry troops occurred in both World Wars. These trains were referred to by railroad personnel as “mains”. Between 1941 and 1945 almost all American soldiers rode a train at some point (over 40 million military personnel). In addition, military personnel on leave as well as POW’s rode the rails. During this period, railroads committed on average a quarter of their coaches and half their Pullmans to running troop trains ,of which there were about 2500 a month. Some months they carried over a million riders and on some days as many as 100,000 traveled. Many of these trains ran over normally freight-only lines, especially if accessing a military base. Railroads such as the Pennsylvania and the New Haven committed even more of their equipment because of their strategic locations. Filling an ocean liner in New York or Boston harbor with 13,000 troops involved as many as 21 trains. These might require over 200 coaches, 40+ baggage cars and over 30 kitchen cars. Troop movements of over 12 hours were assigned Pullman space, if available. Pullmans sometimes slept 30,000 members of the armed services a night. This effort was helped by the fact that Pullman had about 2,000 surplus cars, mostly tourist sleepers, which had been stored instead of scrapped. When extra equipment was required for larger-than-normal troop movements, the government would request removal of sleeping cars from all passenger runs less than 450 miles. This resulted in extra standard sleepers for those times when, for instance, many troops from Europe were being transferred to the Pacific. In 1943 and again in 1945, the government ordered 1200 troop sleepers from Pullman-Standard and 440 troop kitchen cars from ACF. These designs were based on a 50-foot box car equipped with “full-cushion” trucks capable of 100 mph. The center-door sleepers slept 30 in three-tiered, crosswise bunks. While not up to the same standards as the rest of its equipment, Pullman treated these cars service-wise as if they were the same – linen and bedding changed daily, etc. The Korean War again saw troop trains, but by Vietnam the numbers were down. This was due to availability of more large airplanes and also to the reduced capacity of the railroads. After the Korean War, some use of rail was made for reservists going to summer camp. I remember Lackawanna trains in the summer going to Camp Drum near Watertown from New Jersey. My one and only involvement with troop trains was to go from Junction City, Kansas to Oakland, California in September, 1965. I never made a written record of this trip (who expected to be writing about it 25 years later and besides I had other things on my mind). I was part of a large movement of several trains but not in a position to know how many trains were required, what type of equipment was required, or the routes. Both men and equipment went West and not all trains took the same route. The 1st Infantry Division consisted of 15,000 men and tons upon tons of equipment. As much as possible, our equipment was packed in containers which we trucked to rail sidings. Vehicles were driven on flat cars and then tied down. Fortunately, Fort Riley, Kansas had ample sidings at several spots. It was on the Union Pacific. Junction City was not a big rail center; it was named for the junction of two rivers, not the junction of two railroads (although a Katy branch once ran there and a Union Pacific branch to Concordia was intact but out of service). The Rock Island ran on the other side of the fort (a 104-mile branch between Belleville on the Colorado line and McFarland on the Tucumcari line), but was not used at all for this troop movement. The trip began early in the morning (doesn’t everything in the Army?). I rode in a Union Pacific sleeper consisting of 4 double bedrooms, 4 compartments and 2 drawing rooms. I was approximately fifteen cars back but every once in a while I could spot at least three cab units pulling us. Our diner was also Union Pacific and had real china, glasses and tablecloths. While I was an officer, I understand that everybody in the division had comparable transportation. A 1940-era draftee would have felt out of place. 1965 was near the end of good intercity rail transportation. My understanding was that Pullman was contractor to the military to assemble the equipment. They pulled equipment from railroads all over the country. The resulting trains looked like the “rainbow trains” in the first years of Amtrak. We ran day and night, but held up several times for as long as two hours. We went west to Denver, then through Wyoming to Utah. At Ogden, we ended up on the Southern Pacific “Overland Route” through Reno and Sacramento to Oakland. The trip was almost 1900 miles and not as interesting as trains in the East. Remember Reno in the middle of the night: not very sophisticated looking place! The only real excitement was as we neared Oakland and each grade crossing was protected by National Guardsmen (the first train had delays because of war protestors). At Oakland, we pulled onto a siding that ran right on to the dock. This gave us only a short walk to the transport that sailed us across the Pacific. Returning home a year later, I flew all the way to New York and then took a dilapidated New York Central train out of Grand Central. 1966 was about the low point of New York Central service (Penn Central only got worse), but I didn’t mind. See where Alco made diesels (and steam) in Schenectady. Between December, 1941 and June, 1945; US railroads carried almost 44 million armed services personnel; as well as 70% of the nation’s freight. Big job looms, the New York Central is ready. Start of the Korean War in 1950. The New York Central Railroad had what it takes to move the military. When I was much, much younger, I had a bunch of Freedom Train postcards, I cut them up for my stamp collection! Another subject I have always had an interest in is military transportation by rail. One use was the “white train” that was used to transport nuclear weapons from Pantex in Amarillo, TX to various military bases. Another use was the government / military “MX” plan to put missiles on rails and transport them around the United States thus making it very hard for “foreign powers” to track the where abouts of the missiles therefore making it hard to destroy the weapons. I was never a big fan of putting missiles on trains because the next logical step would have been to pass laws making it illegal to take pictures of trains in the interest of national security. I’ve heard that the Southern Pacific would run special trains off of the Tucumcari line and bury these trains in the yard so that nobody would know that they were there. Usually they would had a white caboose and the people on the back of the caboose taking a smoke break carried weapons. Usually these trains would come in at about 3 or 4 in the morning, spend the day buried in the yard and leave the next night shortly after midnight. This would allow them to get out in the desert and be hidden again by daylight. This pattern would be repeated until they reached their destination. I’ve always wondered if the white trains were a decoy. While everyone was watching them, the military would ship the stuff in the week before in a bunch of ratty looking old boxcars, or by plane or truck. That way if someone were to hijack the white train, all they get would be a bunch of empty boxes. Southern Pacific’s east/west traffic artery in Houston sees frequent military movements since the Port of Beaumont has become an important military port. Recently the ATSF handled heavy traffic out of Beaumont for a international military exercise in New Mexico. SP handles military traffic to and from Ft. Polk, Louisiana and Ft. Bliss in El Paso. Houston’s Barbours Cut container port is also used from time to time to handle military moves. Traffic was extremely heavy thru Houston during Desert Storm. 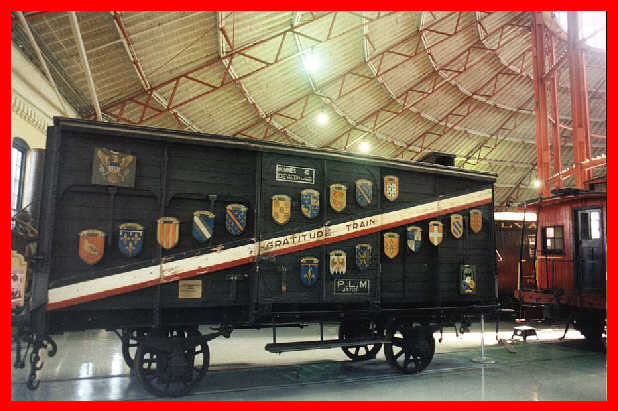 Trains had cabooses used for the armed military escorts. Recent military trains have not had cabooses, allowing the common FREDs do perform sentry duty. All the armor installations have rail connectivity (and the US military tends to own it’s own locomotive’s to switch around on-post). Ft. Lewis in Washington (the state) uses rail quite a bit, shipping tanks to Yakima test range for training missions, moving equipment from one fort to another. BN does all the work delivering to and picking up from Ft. Lewis. I don’t know if they switch on the base, or if the base has an active railroad crew and Army switcher. Hospital rail cars were used to move wounded troops during wars beginning with the Civil War and ending with the Korean War. They ranged from flat cars in the Civil War to specially designed cars in the Second World War and Korean War. Now they use airplanes. I heard a story about the Southern Pacific east of Tucson, Arizona. A military transport trains, with two (2) cabooses filled with marine guards bringing up the rear, was preparing to leave the Tucson yards and head east. The SP had given a radio to the marines in the cabooses so that they could talk with the engineers in the front of the train. As the train was leaving the yard, the engineer told whomever was using the radio in the cabooses something to the effect of “You all settle in back there now. We’ve got about 8 hours of travel ahead of us and so you might as well get a good nights sleep”. The engineer got a typical “Roger” to the message. Finally, the engineer came on the radio and with a great deal of patience explained why that female would not be responding to his inquiries. How about locomotives’ liveries? In WWII, obviously the steam engines were painted BLACK with big white numbers, usually on the tender and cab, and “United States”. During the diesel age, the engines are usually blue (Navy and Air Force) or black or gray (Army) with white numbers and “United States xxxx” with xxxx denoting the branch. “Steel Rails to Victory” written by Ron Ziel, about 1960, covers WWII pretty well with some action shots in Europe. And ALCo couldn’t build diesel RR locomotives because their prime movers were so good in SUBMARINES. I am always remarking on how the military operates as one large chain with every job having an important role in the smooth operations. Most people concentrate on the front line combat soldier, sailor or Marine and forget what it all must take to not only put him/her there, but to keep their mission in operating condition. The U.S. Army Quartermaster Corps was responsible for procuring and delivering various supplies to units in all those theaters. No other area proved to be more challenging than the war in the Pacific Theater with its lengthy supply lines. The first step in the Quartermasters’ duties was procurement, which required more than simply calculating user needs and filling out the correct requisitions. Overcoming numerous hurdles, corpsmen were responsible for making victory possible. Their obstacles started on the home front, where shortages of all basic supplies originated. Further complicating matters was the fact that manufacturing and agricultural production had to be increased immediately. Added this story to honor my boss: Two years in the Infantry with 1st Infantry then umteen years in Quartermaster with 98th Division (Training). Always wears Bronze Star from Viet Nam. His comment: “That MULE TRAIN sure beats a bunch of 50+ year old “deuce and a halfs”. As the decades passed the US military realized such men had been overlooked. They instituted a review in the early 1990’s to determine those that might have been excluded due to race. In 1997, George Watson was posthumously awarded the Medal of Honor. With no family to receive Watson’s medals, they are on display at the US Army Quartermaster Museum in Fort Lee, Virginia. Also, the ship USNS Watson was named in his honor. The United States Coast Guard was founded on a tradition of taking small boats into dangerous conditions to save lives. This skill made Coast Guard coxswains an indispensable part of the Pacific Theater and Smitty would whole-heartedly agree. Coast Guardsmen proved their worth time and time again as they expertly handled small landing craft in and out of almost any situation. No man better exemplifies this prowess than Douglas A. Munro. In Weymouth along the Greenbush there was the Naval Ammunition Depot, its annex in Hingham, and the Bethlehem Steel shipyard in Hingham. The Bethlehem Steel shipyard in Quincy. In Hull there was Ft. Revere and supposedly some 16″ guns brought into Hull via rail during WW2. In South Weymouth the Plymouth line’s tracks pass right by the rear gate of NAS South Weymouth. Of course Camp Edwards on the Cape interacted with the NH. I’m curious about all aspects of the NH’s interaction with all military sites in its service area, small installations or large: NAS Cherry Point, RI, Westover AFB in Springfield, National Guard units, Groton, Submarine base, CT, Boston Navy Yard? The New Haven had a switching yard (totalling about ten miles of track) at Camp Myles Standish. The New Haven was responsible for troop train movements and freight/supply for the camp. None of the yard remains as of today, although the ROW from Taunton to Mansfield can still be explored (one cannot get across Rte 495, however). Camp Miles Standish was a major staging area for the Boston Port of Embarkation in Boston Harbor. Camp Miles Standish was just one of many Army bases located in the Boston area. A Port of Embarkation was a place where troops were actually put on board troop ships and sent off to the war zones. On the New Haven side, the actual Port of Embarkation was the Boston Army Base on the South Boston waterfront. This was served by “Government Yard” which was adjacent to Commonwealth Pier and the Boston Fish Pier. Boston Navy Yard (Charlestown) was on the B&M side of the river. The NH did serve the Military RR in the Quonset point Fleet docks,and the Davisville RI. complex where the Groundpounders were. There is substantially more to see, from a railroad perspective, at the old Hingham Ammunition Depot annex in Hingham, MA. Known as Wampatuck State Park today, the tracks leading into the Hingham Ammunition Depot annex were refurbished sometime during the 1960s in anticipation of processing rail shipment during the Vietnam War, which apparently never happened. The tracks leading into this facility cross Route 3A near the Hingham/Scituate line and if you walk about a mile into the woods along the tracks you’ll find plenty of tracks and plenty of structures from WW2. Most of this discussion so far has involved WW II.There are two other aspects — first the NH sponsorship of two military railway reserve outfits, the 729th Railway Operating Battalion and the 749th Railway Operating Battalion in WW II. The 729th served in Europe. The 749th served in the Philippines. The 729th was reorganized, again with NH sponsorship postwar, and served in the Korean War. The 729th was the predecessor unit of the present 1205th railway unit of the Army Reserve. There was a lot of pressure on dispatchers to move troop trains on time.